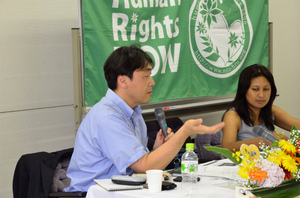 On 26th June, the 2012 Asian Activist-α event was held at Aoyama Gakuin University. The Asian Activist-α Award is given to an individual who makes a real contribution to world change, especially in terms of Human Rights. 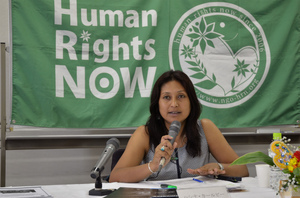 This year, Human Rights Now (HRN) invited Hasina Kharbhih CEO of “Impulse Social Enterprises” from India. This was in recognition of a survey on child labor and the human trafficking situation in India’s Meghalaya State from 2010 with her start-up, the “Impulse NGO Network”. It also respect her long term measures aimed at solving the child labour issue in her home town using the Meghalaya Model as a holistic, multi-sector approach to creating a formal network of organizations, by including the government, International Organizations and the Media for the purpose of tracking and rescuing trafficked children, facilitating rehabilitation, providing families with livelihood alternatives, prosecuting offenders, and raising awareness. Our organization awarded the Asian Activist-α prize to Hasina Kharbhih. 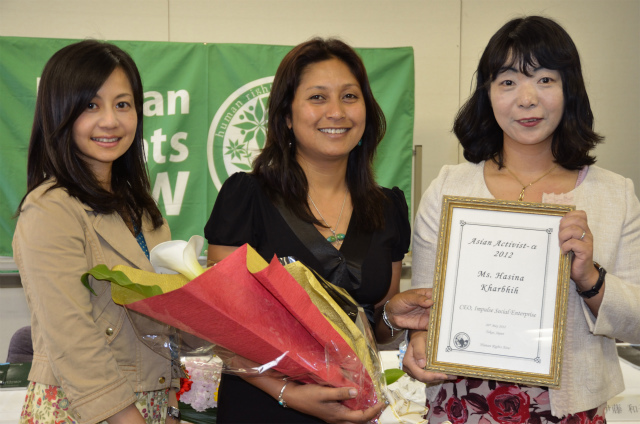 We also invited Mrs. Yukako Narita from the NGO ‘Ace’. 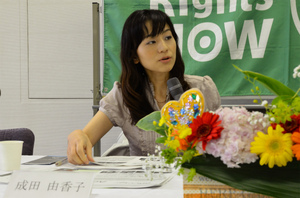 She kindly delivered a lecture on Anti-Child labor action taken by her organization. On 27th June, a Workshop entitled “Child labor and Child Trafficking issues in the South Asia region – concentrating on the issues in Meghalaya State, North East India-” was held. We invited Hasina Kharbhih, Akihito Kuboya and Mr. Kunihiko Hirabayashi, Director of UNICEF Japan, to attend. Hasina lectured on her organization’s report on investigations in Meghalaya state along with presentation of a movie recorded by “France 24.” Mr. Hirabayashi explained how UNICEF’s Child protection works, emphasizing a sustainable education system. Hasina Kharbhih “CEO of Impulse Social Enterprises” left a message for us. 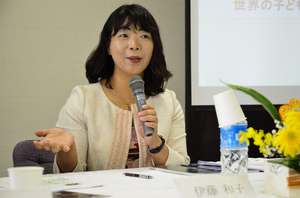 She emphasized how her organization’s achievements were accomplished by much support and help from a large number of people. If you wish to help change the world, you should also take action in any way you possibly can.